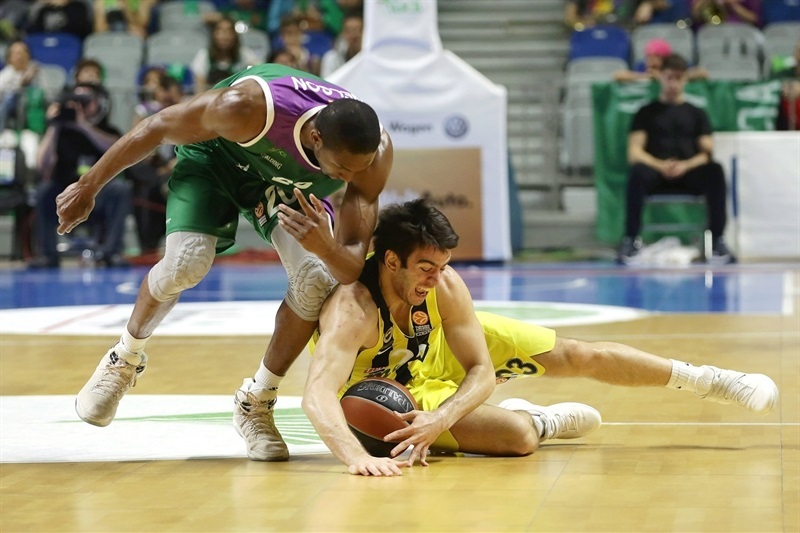 Unicaja Malaga finished the Top 16 on a high note, holding off a depleted group winner Fenerbahce Istanbul 71-67 on Friday night in Malaga. 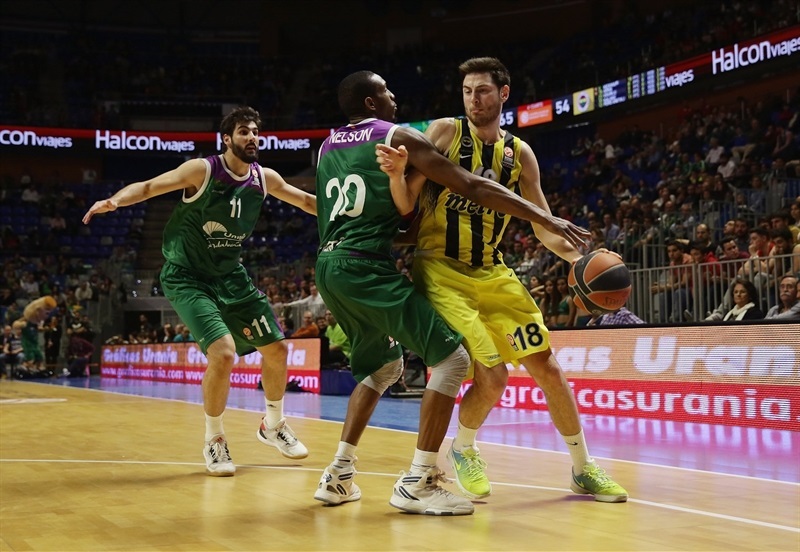 Unicaja finished Top 16 Group E with a 4-10 record and in seventh place, while Fenerbahce dropped to 11-3 and will play Real Madrid in the Turkish Airlines Euroleague Playoffs next week. 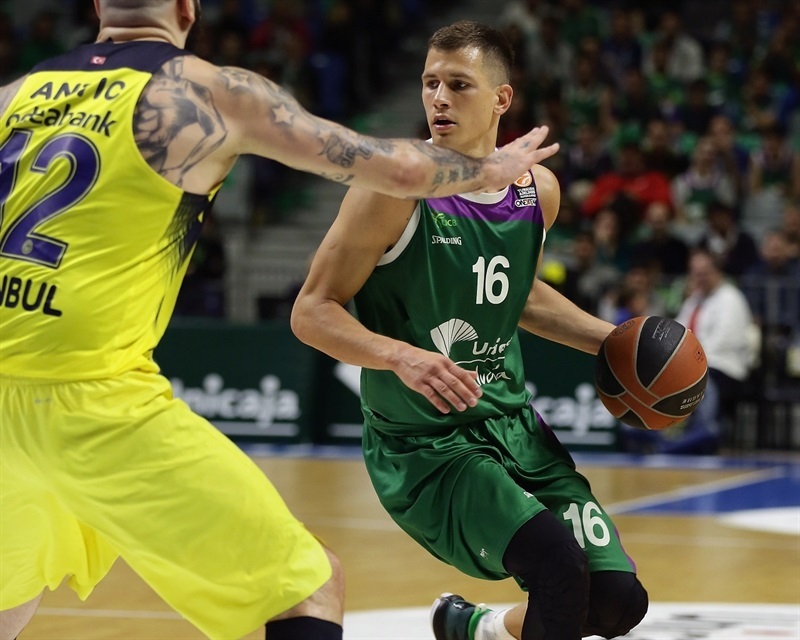 Nemanja Nedovic got Unicaja’s offense going in the first quarter, before he and Jack Cooley fueled a 12-3 second quarter run to give the hosts a 39-28 halftime lead. The margin reached 16 points in the third before Egehan Arna hit a pair of triples that helped cut the deficit to 4 points. But the visitors never got closer than that the rest of the way. Cooley finished with a career-high 17 points and Nedovic had 14, while Mindaugas Kuzminskas scored 9 in victory. 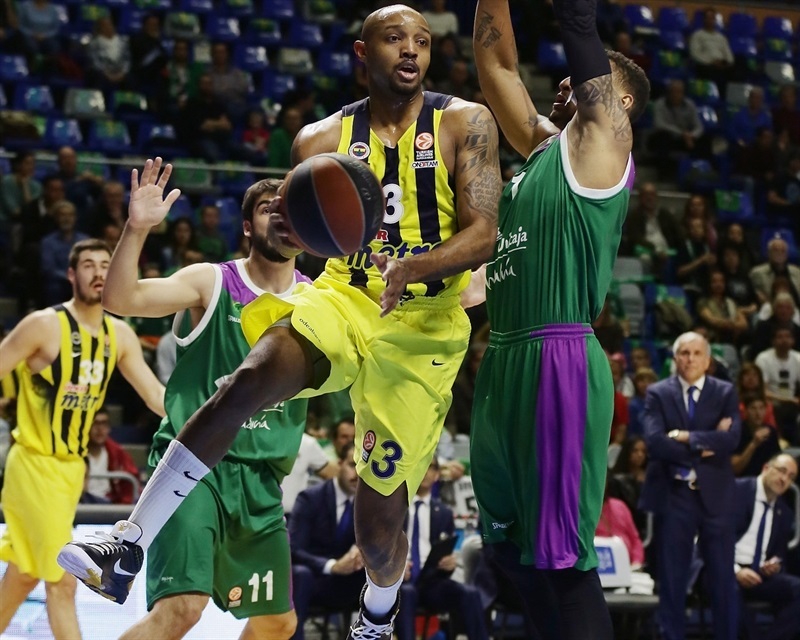 Ricky Hickman and Pero Antic each scored 12 for the visitors who in addition to the injured Jan Vesely, were also without Bobby Dixon, while Ekpe Udoh, Bogdan Bogdanovic and Luigi Datome played limited minutes. 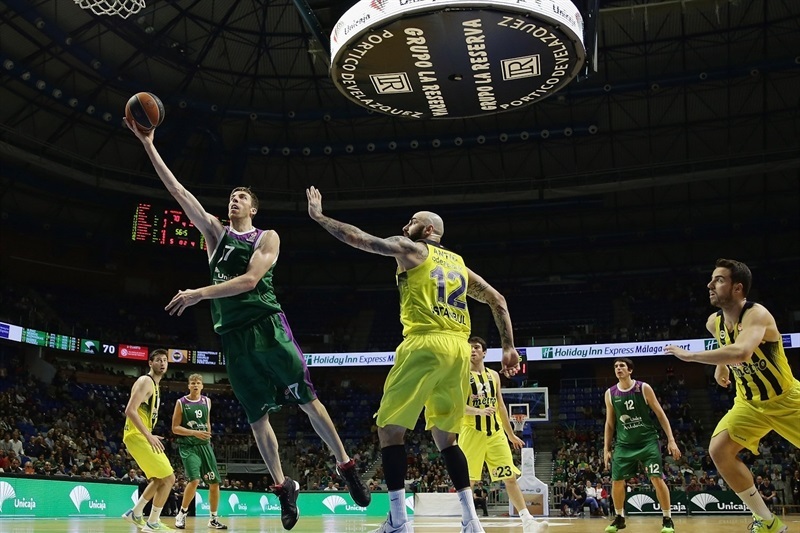 Cooley scored inside and Nedovic added a driving layup for Unicaja early on. Nikola Kalinic nailed a corner triple to open Fenerbahce’s account, but Nedovic answered with a corner three of his own. 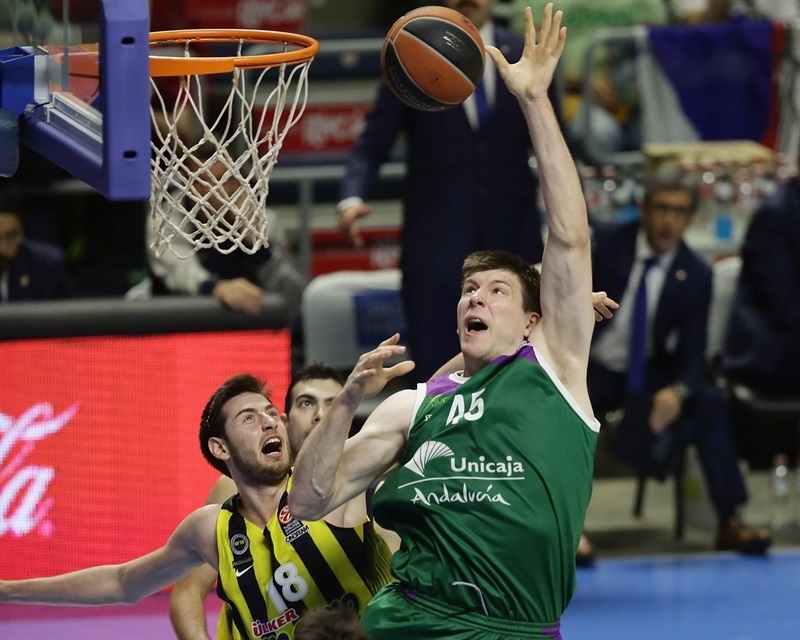 Nedovic followed with a transition jumper, and after Bogdan Bogdanovic had a tip-in for the visitors, Mindaugas Kuzminskas knocked down a corner triple to open a 12-6 advantage. 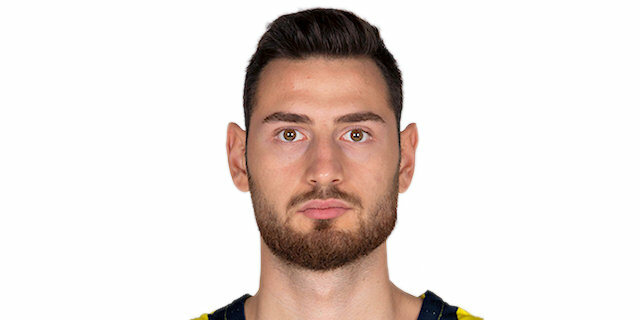 However, Kostas Sloukas answered with a long jumper before Bogdanovic and Sloukas hit back-to-back three-pointers to cap a 0-8 Fenerbahce run. After a timeout, Kuzminskas scored inside for the hosts and then fed Carlos Suarez inside with a lob pass. A tip-in from Fran Vazquez opened an 18-14 lead, but Antic hit a triple and after Vazquez made an elbow jumper, Antic hit another wide-open three to tie it at 20-20. 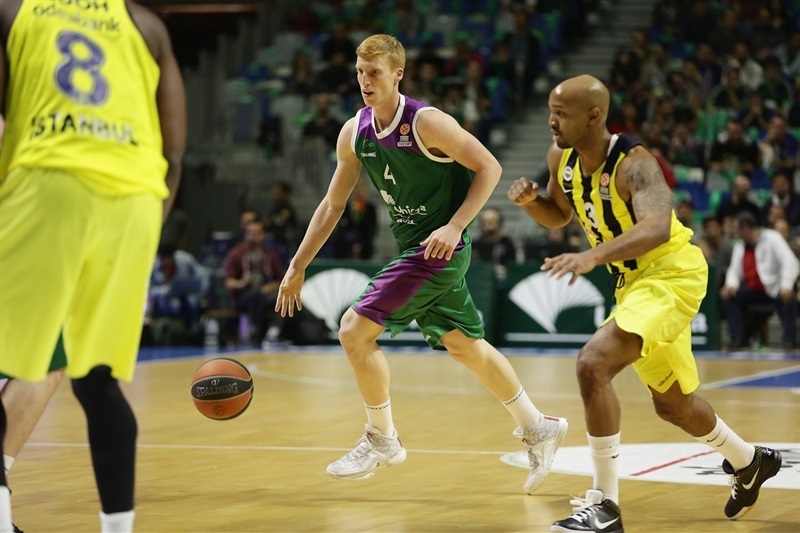 Unicaja’s Edwin Jackson answered with an off-the-dribble triple in the last second of the quarter to make it 23-20. Will Thomas scored inside for the hosts, but Hickman bettered him with a triple on the other end. Jackson scored from close range, and after a basket from Antic, Cooley made it 29-25. After foul shots from Thomas, a triple from Nedovic opened 34-25 margin. Antic got a favorable bounce on a jumper, but free throws from Cooley and Jackson gave Unicaja a double-digit margin, 37-27. Baskets were few and far between, and after Antic split free throws, Cooley found a way to score inside and make it 39-28 at halftime. Kuzminskas made a floater and then fed the trailing DeMarcus Nelson on a breakaway to make it 43-28. Hickman drove to the hoop on the other end, but foul shots from Nedovic and Kuzminskas opened a 46-30 lead. Egehen Arna hit a corner three before Udoh scored inside, and Arna made a steal and finished a fast break with a dunk to cut it to 46-38. After a timeout, Hickman hit a triple that cut the difference to 46-41. Jackson hit a tough jumper and Thomas fed Cooley inside to make it 52-43. With most of Fenerbahce’s starters sitting, Arna used the opportunity and nailed another three, before Udoh’s foul shots cut the deficit to 4 points. However, Cooley scored twice inside, and Thomas scrambled to score in the waning seconds of the quarter to make it 58-48. Cooley had another put-back to open a 12-point lead, and after Kalinic’s three-point play, Thomas had a tip-in to make it 62-52. 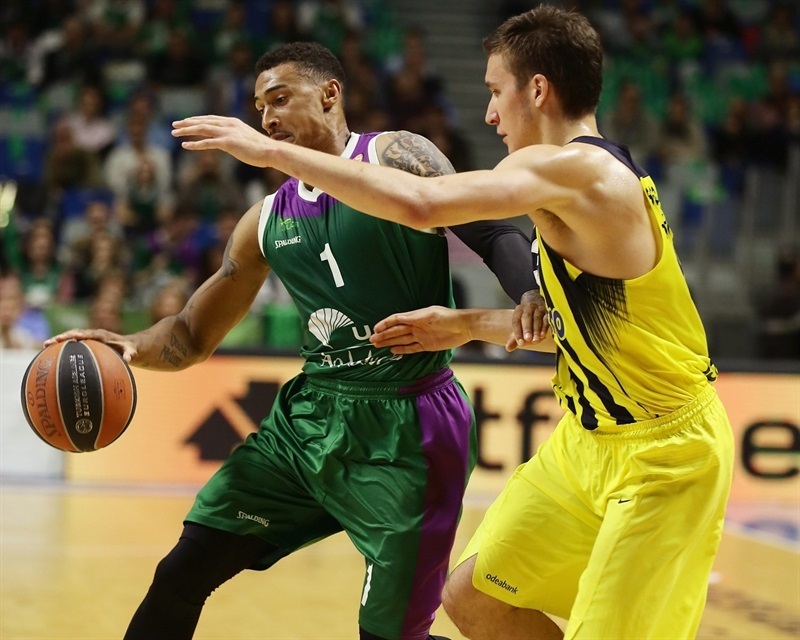 Hickman had a fast break layup for the visitors, but Nelson scored on a breakaway for Unicaja at the other end. A runner from Hickman, before free throws from Kalinic and Berk Ugurlu, cut it to 65-59. But Fran Vazquez made a put-back after Unicaja’s 12th offensive rebound, and his jumper with 83 second left sealed the deal at 70-59. 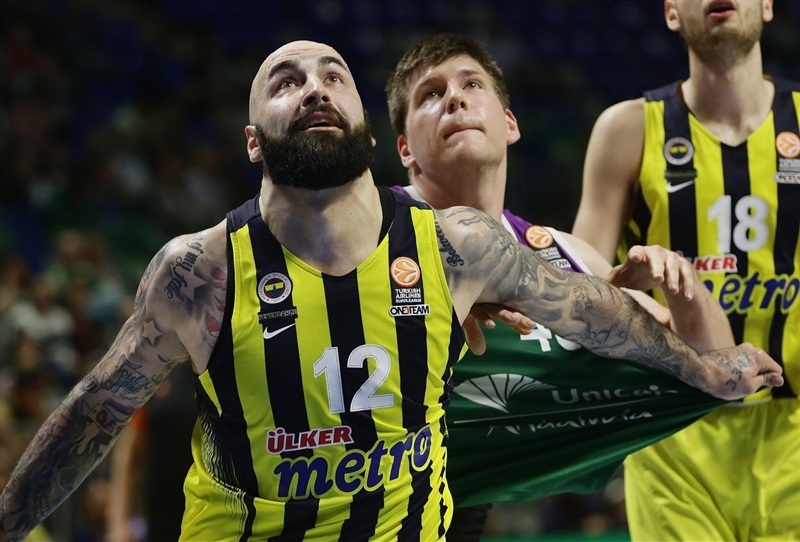 Before the game’s end, Fenerbahce youngsters Ugurlu and Ercan Bayrak made baskets, and Ugurlu’s three-pointer in the final seconds rounded out the scoring. "It was a match with unusual circumstances. We were missing players, but we competed at a good level doing things that we needed to do. We made a great effort tonight. We had six players above eight points and a large percentage of our two-pointers went it. We also had fewer turnovers than other days. We made some mistakes in the final part of the game that allowed them to reduce the difference. 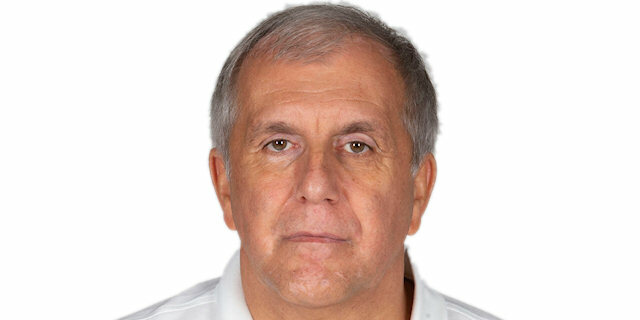 They are a great team and now the players that come to the court do as all players of Obradovic: they play with great intensity and desire to do well." "Today's game was our fourth in a week. We have had a couple of games in the Turkish League against very tough opponents. For us, this trip to Malaga has not been easy and we knew that the game would not be, either. Today we have given opportunities to young players. In the first part we were unable to stay even and in the second half we come out more focused, but it was not enough." "It was a good game for us. Today, the whole team has made a great effort. We focused the game with the aim of stepping forward to Sunday's game in the Spanish League, which is a very important game for us. Today the fans applauded me and I am very grateful. They are the best fans in Europe and I am happy to see how they are happy when I play well." "The game tonight was like a workout for us. 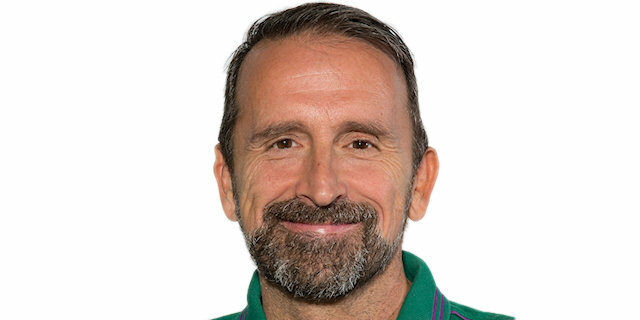 We have worked on aspects of the game looking ahead to the playoffs, which we start in a few days. We managed to see some things we need to improve and change. The coach has given opportunities today to young players like me."